^ Huxley, T.H. (1868). “On the animals which are most nearly intermediate between birds and reptiles”. Annals and Magazine of Natural History. 2: 66–75. ^ Foster, Michael; Lankester, E. Ray 1898–1903. The scientific memoirs of Thomas Henry Huxley. 4 vols and supplement. London: Macmillan. ^ Paul, Gregory S. (2000). “A Quick History of Dinosaur Art”. In Paul, Gregory S. (ed.). The Scientific American Book of Dinosaurs. New York: St. Martin's Press. pp. 107–112. ISBN 0-312-26226-4. ^ a b Turner, A.H.; Makovicky, P.J. ; and Norell, M.A. (2007). “Feather quill knobs in the dinosaur Velociraptor” (PDF). Science 317 (5845): 1721. doi:10.1126/science.1145076. PMID 17885130. http://www.sciencemag.org/cgi/reprint/317/5845/1721.pdf. ^ Feduccia, A. Lingham-Soliar, T., and Hinchliffe, J.R. (2005). "Do feathered dinosaurs exist? Testing the hypothesis on neontological and paleontological evidence." Journal of Morphology, 266: 125-166. ^ Ji, Q., and Ji, S. (1996). 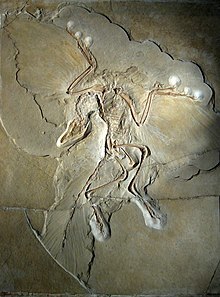 "On discovery of the earliest bird fossil in China and the origin of birds." Chinese Geology 10 (233): 30-33. ^ Qiang, J., .Currie, P.J., Norell., M.A. & Shu-An, J., 1998. Two feathered dinosaursfrom northeastern China. Nature 393 753-761. ^ Xu, X., Zhou, Z., and Wang, X. (2000). "The smallest known non-avian theropod dinosaur." Nature, 408 (December): 705-708. ^ Barsbold, R., Osmólska, H., Watabe, M., Currie, P.J., and Tsogtbaatar, K. (2000). "New Oviraptorosaur (Dinosauria, Theropoda) From Mongolia: The First Dinosaur With A Pygostyle". Acta Palaeontologica Polonica, 45(2): 97-106. ^ Czerkas, S.A., Zhang, D., Li, J., and Li, Y. (2002). “Flying Dromaeosaurs”. In Czerkas, S.J.. Feathered Dinosaurs and the Origin of Flight: The Dinosaur Museum Journal 1. Blanding: The Dinosaur Museum. pp. 16–26. ^ Zhang, F., Zhou, Z., Xu, X. & Wang, X. (2002). "A juvenile coelurosaurian theropod from China indicates arboreal habits." Naturwissenschaften, 89(9): 394-398. doi=10.1007 /s00114-002-0353-8. ^ a b Mayr, G., Peters, D.S., Plodowski, G. and Vogel, O. (2002). "Bristle-like integumentary structures at the tail of the horned dinosaur Psittacosaurus." Naturwissenschaften, 89: 361–365. ^ Xu, X. and Wang, X.-L. (2003). "A new maniraptoran from the Early Cretaceous Yixian Formation of western Liaoning." Vertebrata PalAsiatica, 41(3): 195–202. ^ a b Xu, X., Norell, M. A., Kuang, X., Wang, X., Zhao, Q., Jia, C. (2004). “Basal tyrannosauroids from China and evidence for protofeathers in tyrannosauroids”. Nature 431: 680–684. doi:10.1038/nature02855. ^ Xu, X., and Zhang, F. (2005). "A new maniraptoran dinosaur from China with long feathers on the metatarsus." Naturwissenschaften, 92(4): 173 - 177. ^ Ji, Q., Ji, S., Lu, J., You, H., Chen, W., Liu, Y., and Liu, Y. (2005). "First avialan bird from China (Jinfengopteryx elegans gen. et sp. nov.)." Geological Bulletin of China, 24(3): 197-205. ^ Turner, Alan H.; Pol, Diego; Clarke, Julia A.; Erickson, Gregory M.; and Norell, Mark (2007). “A basal dromaeosaurid and size evolution preceding avian flight” (PDF). Science 317: 1378–1381. doi:10.1126/science.1144066. PMID 17823350. http://www.sciencemag.org/cgi/reprint/317/5843/1378.pdf. ^ Goehlich, U.B., Tischlinger, H., and Chiappe, L.M. (2006). "Juraventaor starki (Reptilia, Theropoda) ein nuer Raubdinosaurier aus dem Oberjura der Suedlichen Frankenalb (Sueddeutschland): Skelettanatomie und Wiechteilbefunde." Archaeopteryx, 24: 1-26. ^ Ji, S., Ji, Q., Lu J., and Yuan, C. (2007). "A new giant compsognathid dinosaur with long filamentous integuments from Lower Cretaceous of Northeastern China." Acta Geologica Sinica, 81(1): 8-15. ^ He, T., Wang, X.-L., and Zhou, Z.-H. (2008). "A new genus and species of caudipterid dinosaur from the Lower Cretaceous Jiufotang Formation of western Liaoning, China." Vertebrata PalAsiatica, 46(3): 178-189. ^ Zhang, F., Zhou, Z., Xu, X., Wang, X., & Sullivan, C. (2008). "A bizarre Jurassic maniraptoran from China with elongate ribbon-like feathers." Available from Nature Precedings, doi:10.1038/npre.2008.2326.1 . ^ Xu, X., Zhao, Q., Norell, M., Sullivan, C., Hone, D., Erickson, G., Wang, X., Han, F. and Guo, Y. (in press). "A new feathered maniraptoran dinosaur fossil that fills a morphological gap in avian origin." Chinese Science Bulletin, 6 pages, accepted November 15, 2008. ^ Oliver Rauhut, Christian Foth, Helmut Tischlinger, Mark A. Norell: Exceptionally preserved juvenile megalosauroid theropod dinosaur with filamentous integument from the Late Jurassic of Germany. In: PNAS, 2. Juli 2012. doi:10.1073/pnas.1203238109, S. 1–6. ^ Czerkas, S.A., and Ji, Q. (2002). "A new rhamphorhynchoid with a headcrest and complex integumentary structures." Pp. 15-41 in: Czerkas, S.J. (Ed.). Feathered Dinosaurs and the Origin of Flight. Blanding, Utah: The Dinosaur Museum. ISBN 1-932075-01-1. ^ a b Prum, R. & Brush A.H. (2002). “The evolutionary origin and diversification of feathers”. The Quarterly Review of Biology 77: 261–295. doi:10.1086/341993. ^ Göhlich, U.B., and Chiappe, L.M. (2006). "A new carnivorous dinosaur from the Late Jurassic Solnhofen archipelago." Nature, 440: 329-332. ^ Xu, X. and Guo, Y. (2009). 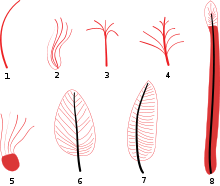 "The origin and early evolution of feathers: insights from recent paleontological and neontological data." Vertebrata PalAsiatica, 47(4): 311-329. DinoBuzz, dinosaur-bird controversy explained, by UC Berkeley. Journal of Dinosaur Paleontology, with many articles on dinosaur-bird links.